Special assistance at the airport: what is it and how to order it? Online check-in: What is it? Travel by plane is the fastest and the safest way of travelling that is used by more and more people. Carriers have many cheap flights to different corners of the world in their offer, and an airline ticket can be purchased online. However, we have to go through check-in and security procedure at the airport. 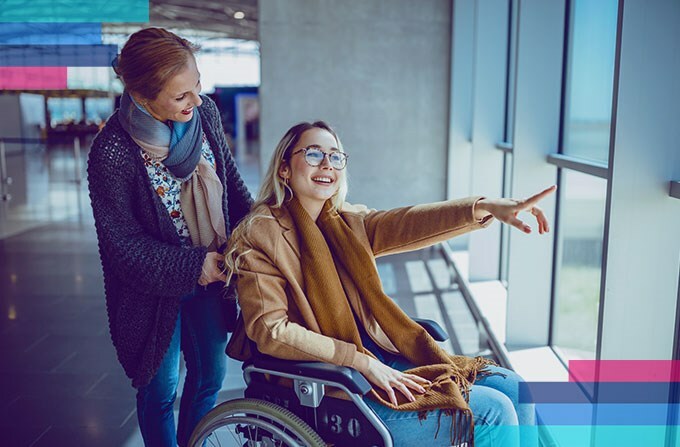 Unfortunately, passengers with disabilities may have problems with moving around the airport and going through the necessary security procedure. In this case, it's worth using the special assistance. What is a special assistance? This is the assistance that the airport employee provides to the passenger. Disabled persons with reduced mobility may use this service. Depending on the needs of the passenger, the employee can help him in the check-in process and boarding the plane. Thanks to the presence of an airport employee, people with hearing, visual, psychological or physical disabilities can easily go through the entire preparation process and safely board the plane. If necessary, the passenger is equipped with a wheelchair or other vehicle. Special assistance is also provided after the flight - an airport employee can help you get off the plane and provide assistance with baggage collecting process and security procedures. Some airports and airlines have special rooms for people with disabilities in their offer. Who can order special assistance at the airport? Special assistance allows for a comfortable and stress-free journey, but it's worth remembering that not every passenger can take advantage of this type of services. If the passenger is unable to understand simple massages from the personnel, use the toilet without help, hold the upper body vertically without assistance or specialized medications, the carrier may require the passenger to be accompanied by another person, at least 16 years old. The accompanying person must be healthy. In case of doubt, it's worth contacting an airline representative in advance to determine the flight conditions. How to order a special assistance? Special assistance at the airport is free. To use this service, please contact the carrier during the booking process or directly before the flight. You can do it by phone or by filling a special form (among other things, you must provide knowledge about the medical condition of the passenger, including the need to provide him with a wheelchair). Attention! Individual carriers and airports independently determine the time when they should be informed about the need for special assistance. For example, some airports asks for contact at least 72 hours before the flight, and others - 48 hours before the flight. It's also worth checking the range of a special assistance service offered by a given carrier. Some airlines offer special assistance to the elderly as well. The service includes not only help at the airport, but also the possibility of choosing a more comfortable seat and the possibility of adjusting the meal on board to the passenger's diet. Order the special assistance at the airport with eSky! To ensure the comfort and safety of our customers, we can help to order special assistance at the airport. In order to determine the details, please contact us using the form on our website. The tips and suggestions in this article and related articles are for informational purposes only and may not constitute the basis for any claim against eSky.com. Interested but need more info?